I have written before about how the Late Neolithic sample from Zvejnieki seemed to be an outlier among Corded Ware samples (read also the Admixture analysis section on the IEDDM), due to its position in PCA, even more than its admixture components or statistical comparison might show. Computing D-statistics for each individual of the form D(Baltic LN, Yamnaya; X, Mbuti), we find that the two individuals from the early phase of the LN (Plinkaigalis242 and Gyvakarai1, dating to ca. 3200–2600 calBCE) form a clade with Yamnaya (Supplementary Table 7), consistent with the absence of the farmer-associated component in ADMIXTURE (Fig. 2b). 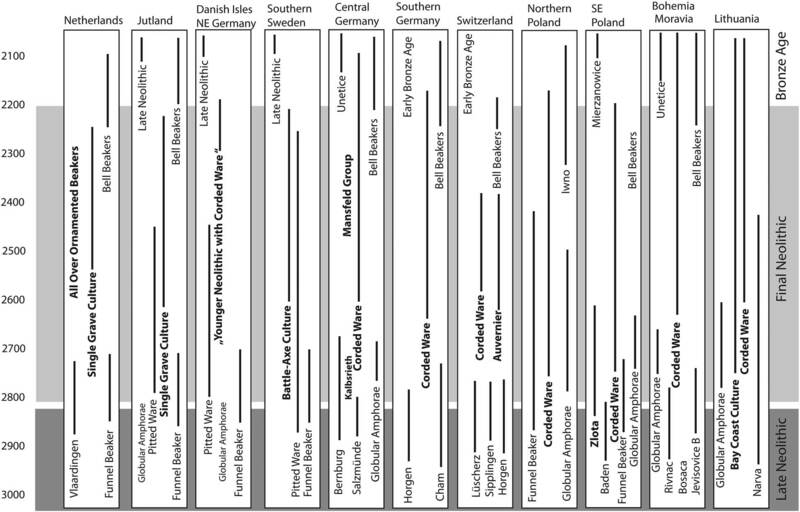 Younger individuals share more alleles with Anatolian and European farmers (Supplementary Table 7) as also observed in contemporaneous Central European CWC individuals2. My interpretation of the Zvejnieki sample ca. 2880 BC (and thus also of the only Baltic LN sample forming a close cluster with it) as ‘outlier’ seems thus reinforced as more samples come in. My explanation based on exogamy is one possibility for the region. After all, great mobility and exogamy practices are universally accepted for the Corded Ware territory, and Yamna migrants had settled up along the Prut precisely around this period (ca. 3100-2900 BC), so this kind of relation between Yamna and Baltic samples is to be expected. 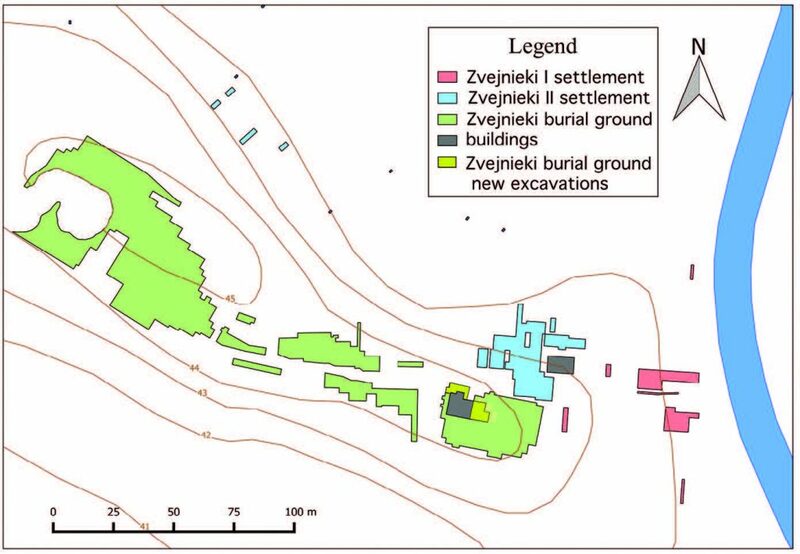 NOTE: Information on the Late Neolithic burial of Zvejnieki is scarce, since it is an isolated find in radiocarbon analysis, among Mesolithic burials. You can read more about it from Ilga Zagorska’s studies, such as The use of ochre in Stone Age burials of the East Baltic (2008), The persistent presence of the dead: recent excavations at the hunter-gatherer cemetery at Zvejnieki (Latvia) (Antiquity 2013), or Dietary freshwater reservoir effects and the radiocarbon ages of prehistoric human bones from Zvejnieki, Latvia (J. Archaeol. Sci. 2016). 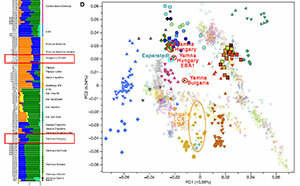 The only two samples clustering more closely to Yamna cluster also closely to the three previous samples from Khvalynsk in Samara (labelled ‘Steppe Eneolithic’ in the paper), which makes one wonder how strongly connected were cultures from the forest and forest-steppe zones before the expansion of Corded Ware and Yamna settlers. Plinkaigalis 242, >40 year old female (OxA-5936, 4280 ± 75 BP, 3260–2630 calBCE). The burial site is located in the plains of central Lithuania on the eastern bank of the river Šušvė on the outskirts of the Plinkaigalis village, approximately 400 m southeast of an Iron age hill fort and settlement. The burial site was discovered in 1975 when local residents started digging for gravel in the western part of the hill. The same year site was granted a legal protection with archaeological excavations carried out for eight straight years in a row (1977-1984). During the eight years of fieldwork a total of 373 graves (364 inhumation and 9 cremation graves) with all but two of them dating to 3rd to 8th c. AD were uncovered. The two exceptional graves (no. 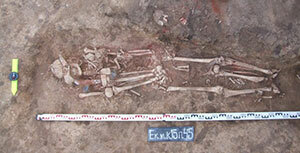 241, 242) were uncovered in the northern part of the burial site and C14 dated to the Late Neolithic. Gyvakarai 1, 35-40 year old male (Poz-61584, 4030 ± 30 BP, 2620–2470 calBCE). The burial site is located in the northern part of Lithuania on the steep gravelly bank (elevation up to 79 m a. s. l.) of the rivulet Žvikė, 500 m to the south from where, in the wet grassland valley, it meets the main stem river Pyvesa. The site was discovered in 2000 when local residents started digging for gravel in the central part of the gravelly bank. The same year rescue excavations were conducted in the surrounding area of the highly disturbed grave resulting in discovery of a single grave C14 dated to the Late Neolithic. 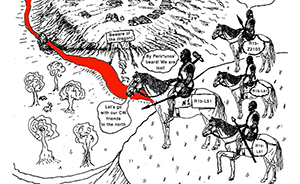 EDIT (16 FEB 2018): A commentator noted that Gyvakaray1 was also studied for Yersinia pestis, a disease which appears to have expanded first to the west from the steppe, and then to the east, so it is possible that its position in PCA related to Plinkaigalis242 shows a connection to late Yamna settlers or East Bell Beaker migrants. NOTE: I haven’t had the time and patience to work with my virtual computer on the PCA of these new samples – my CPU is reaching everyday its limit and my fans work half the time – , so I don’t know exactly which of them is Plinkaigalis242 and which Gyvakarai1, I just made a wild guess (based on ADMIXTURE) that the earlier Plinkaigalis242 forms a common ‘outlier’ group with Zvejnieki; if they are reversed or otherwise wrong in the image, please correct me. It will be much appreciated. We can see from the additional samples in Mittnik et al. 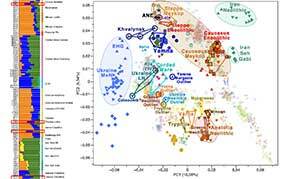 (2018) that the common cluster formed by most Baltic LN samples in PCA (most of them with clear cultural context among Late Neolithic or Corded Ware material, unlike the two ‘outliers’ and Gyvakarai1) is among Ukraine Eneolithic samples, European Corded Ware samples, and also Mesolithic-Neolithic samples from the Baltic. 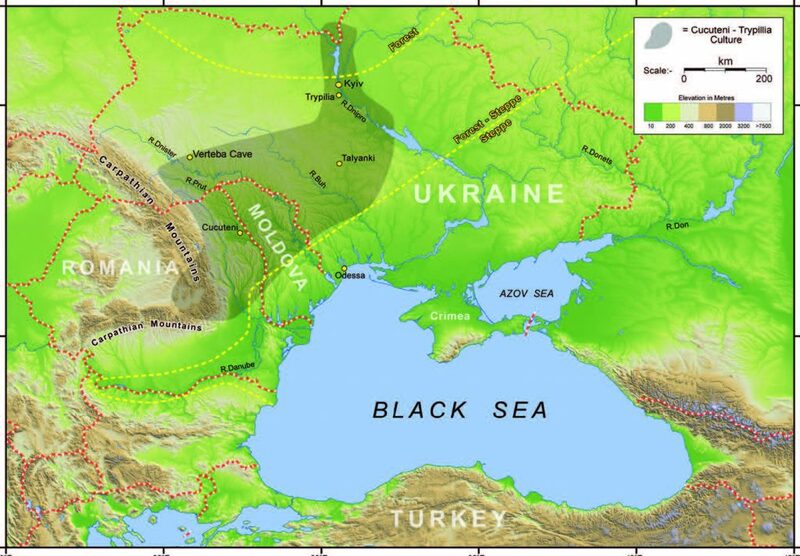 This is a logical find in light of the mainstream opinion that the expansion of the third horizon of the Corded Ware culture seems to have begun in the Dnieper-Dniester region (a corridor of steppe, steppe-forest, and forest zones) ca. 3300 BC. Their situation in PCA among Khvalynsk (Samara), Baltic Mesolithic, East Hunger-Gatherer samples, Yamna and Eneolithic Ukraine leaves us without enough information to understand their actual origin. EDIT (3 FEB 2018): In the first edition of my IEDDM paper I based the potential expansion of the Corded Ware culture mainly on Piezonka’s detailed analyses of the evolution of Mesolithic and Neolithic cultures in the forest-steppe and Forest Zone, and on later phylogeographic finds, since there were no samples from these regions in this interesting period. I revised it in the second edition to accomodate the model to the Indo-Uralic proto-language supported by the Leiden school, and identified it with a a close Neolithic-Chalcolithic steppe community based on common language guesstimates and – after the latest revision of Mathieson et al. (2017) – on the appearance of steppe admixture in the steppe. 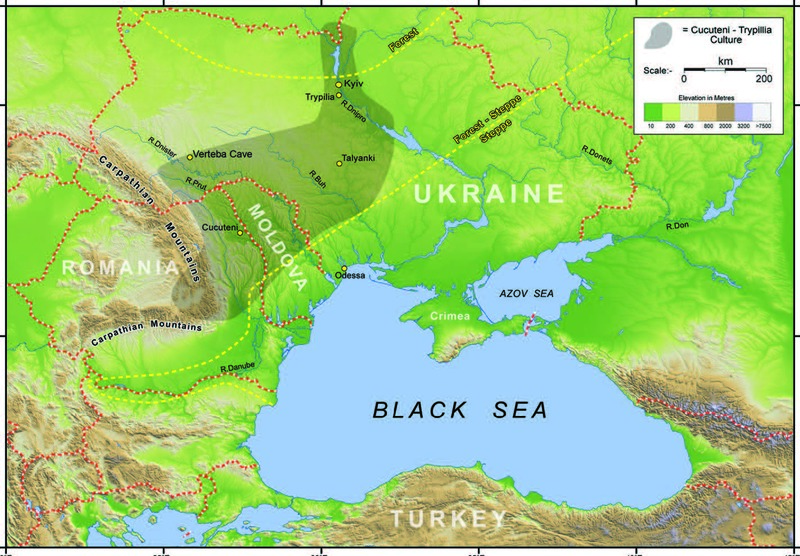 However, if traditional Uralicists are right in supposing a loose Neolithic community in the Forest Zone, and Kristiansen is right in supposing long-lasting contacts in the Dniester-Dnieper region, we might actually be seeing with these ‘outliers’ the first proof that Neolithic samples from the forest-steppe and Forest Zone of the 4th millenium – unrelated to the Corded Ware culture – clustered closely to Khvalynsk, Sredni Stog, or Yamna samples, which is compatible with Piezonka’s accounts of intercultural contacts. Acceptance of the results of radiometric dating meant that the concept of the so called ‘A-Horizon’ also had to be reformulated. If we are dealing with such a phase at all, it is not a classic typological period that is defined by a uniform material culture inventory, but rather a set of types which show a wide distribution, but which are always integrated into a locally specific and thus regionally variable context. The situation resembles that of the Bell Beakers, where a few supra-regional types are associated with local forms of ‘Begleitkeramik’ (i.e. pottery that accompanies Bell Beakers: Strahm 1995; Besse 1996). The distribution data indicate that this set of forms (namely the A-Beaker, ‘A-Amphora’, and A-Battle Axe, as well as Herringbone-decorated Beakers) was to be found over much of Europe around 2700 BC, and that the currency of these forms was not short: they seem to have been used continuously during the Final Neolithic, perhaps even until 2000 BC (Fig. 3; Furholt 2004). Analysis of the radiometric and dendrochronological determinations also indicates that the A-Horizon is not the earliest Corded Ware phase. Instead, it appears to follow an apparent earlier phase in Poland during which Corded Ware pottery was in use from as early as 2900 BC (Furholt 2003; 2008a; Wödarczak 2006; Ullrich 2008). While widening networks and a change in the mechanism of exchange appears to have contributed to the emergence of the Corded Ware archaeological phenomenon, and also the contemporaneous Yamnaya graves (Harrison & Heyd 2007) and the following Bell Beaker and Early Bronze Age phenomena, it remains to be seen exactly what factors contributed to the development of these systems. It may be that there were changes in subsistence practices, perhaps involving a rising importance of animal herding that subsequently required higher mobility (for a discussion see Dörfler & Müller 2008), but considering the obvious diversity in subsistence patterns present in different Corded Ware groups, such an explanation would seem appropriate for the transformation in some regions, but surely not for the eastern hunterfisher-gatherer groups of the Baltic (Bläuer & Kantanen 2013). Also, trade with amber and copper might have played its role, but there are so far no indications for a significant rise in quantity or reach of these two materials in connection with Corded Ware graves or settlements (Furholt 2003, 125–7). The impacts of animal traction and the wagon are also to be taken into account, as they are present since 3400 BC (Mischka 2011) but does at least not play any visible role in Corded Ware burial rituals, very much in contrast to the previous periods (Johannsen & Laursen 2010). 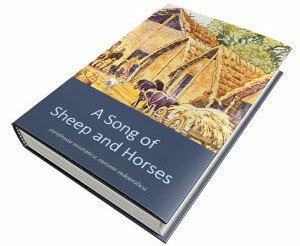 There is no evidence for horse riding, but the domesticated horse seems to be present in central Europe since before 3000 BC (Becker 1999) and have also been found in Corded Ware settlements (Becker 2008), but again the evidence of domesticated horses is much more abundant in the period before 3000 BC. So, concerning amber and copper exchange, or the impact of the wheel and animal traction, there is the recurrent motive of stronger evidence for the period before 3000 BC than during or in connection to Corded Ware finds after 2700 BC. The evidence strongly points towards a long period of coalescence from 3000 to 2700 BC, when several innovations in burial customs, pottery, and tool types sprung forth from different places and subsequently spread via different networks of exchange and interaction. These surely showed a significant rise in scale, reach, and impact on local practices, but the same is true for the contemporary Globular Amphora and Yamnaya ‘Cultures’. This exchange resulted, roughly spoken, in a phenomenon like the A-Horizon. 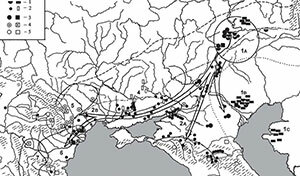 Thus, it seems reasonable to explain the wide regional reach of those Corded Ware elements as the result of a general increase in mobility and thus an increase in the spatial extension of regional networks, triggered by the long-term effects of technological innovations and connected economic and social transformations in Europe since 3400 BC. It is the increase in mobility and regional networks that is new to the European Neolithic Societies after this time, and it is not only the Corded Ware elements, that are spread through these channels but also Yamnaya, Globular Amphorae, Bell Beaker ‘Cultures’, and copper and bronze artefacts in later periods. Those are archaeological classification units, heuristic tools for the ordering of finds, while brushing over variability and overlapping traits, and so they should not be confused with real social groups. As a summary, we can say that there is still much work to be done on the origins and expansion of the Corded Ware culture, and that speculative interpretations of recent genetic papers (especially since 2015), based solely on scarce genetic finds, are not doing much in favour of sound anthropological models by connecting directly Yamna to Corded Ware (and the latter to Bell Beaker), as the multiple new anthropological ‘steppe’ models (and their unending revisions due to the gradual corrections from ‘Yamnaya’ to ‘steppe’ admixture in genetic papers) are showing. 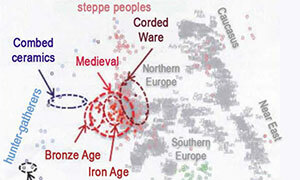 Featured image, from Furholt’s article: Map of the Corded Ware regions discussed for central Europe. The dark shading indicates those regions where Corded Ware burial rituals are present regularly. 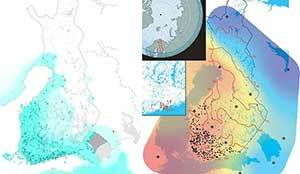 Open Access The genetic prehistory of the Baltic Sea region, by Mittnik et al., Nature Communications 9: 442 (2018), based on preprint The Genetic History of Northern Europe, at BioRxirv. In the archaeological understanding, the transition from Mesolithic to Neolithic in the Eastern Baltic region does not coincide with a large-scale population turnover and a stark shift in economy as seen in Central and Southern Europe. Rather, it is signified by a change in networks of contacts and the use of pottery, among other material, cultural and economic changes. 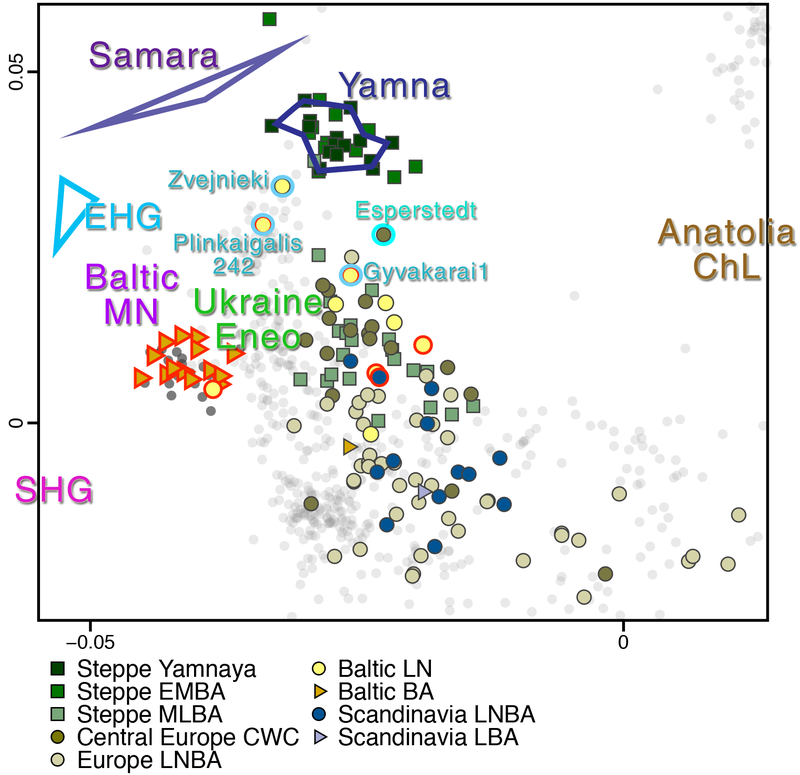 Our results suggest continued admixture between groups in the south of the Eastern Baltic region, who are more closely related to WHG, and northern or eastern groups, more closely related to EHG. Neolithic social networks from the Eastern Baltic to the River Volga could also explain similarities of the hunter-gatherer pottery styles, although morphologically analogous ceramics might also have developed independently due to similar functionality. 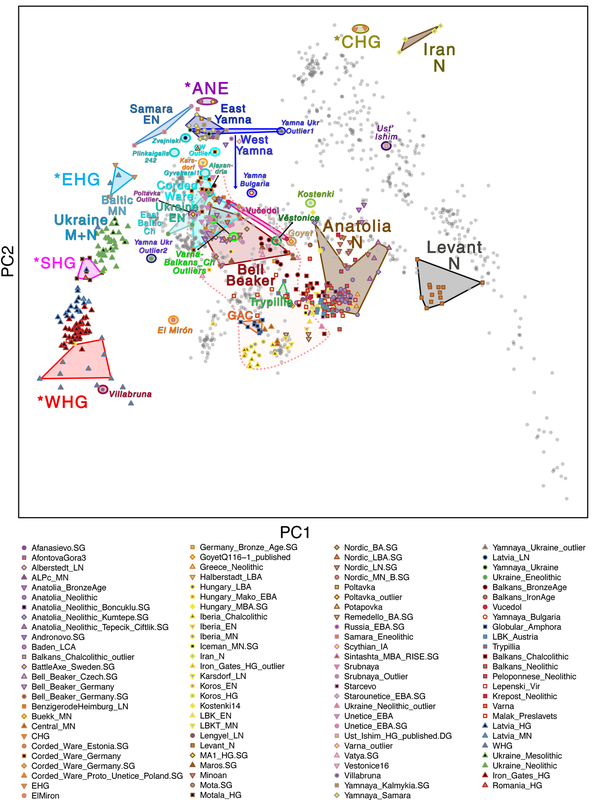 The genetic evidence for a change in networks and possibly even a large-scale population movement is most pronounced in the Middle Neolithic in individuals attributed to the CCC. The distribution of this culture overlaps in the north with the Narva culture and extends further north to Finland and Karelia. Its spread in the Eastern Baltic is linked with a significant change in imported raw materials, artefacts, and the appearance of village-like settlements15. We see a further population movement into the regions surrounding the Baltic Sea with the CWC in the Late Neolithic that was accompanied by the first evidence of extensive animal husbandry in the Eastern Baltic. The presence of ancestry from the Pontic-Caspian Steppe among Baltic CWC individuals without the genetic component from north-western Anatolian Neolithic farmers must be due to a direct migration of steppe pastoralists that did not pick up this ancestry in Central Europe. It suggests import of the new economy by an incoming steppe-like population independent of the agricultural societies that were already established to the south and west of the Baltic Sea. The presence of direct contacts to the steppe could lend support to a linguistic model that sees an early branching of Balto-Slavic from a Proto-Indo-European language, for which the west Eurasian steppe was proposed as a homeland. However, as farmer ancestry is found in later Eastern Baltic individuals, it is likely that considerable individual mobility and a network of contact throughout the range of the CWC facilitated its spread eastward, possibly through exogamous marriage practices. 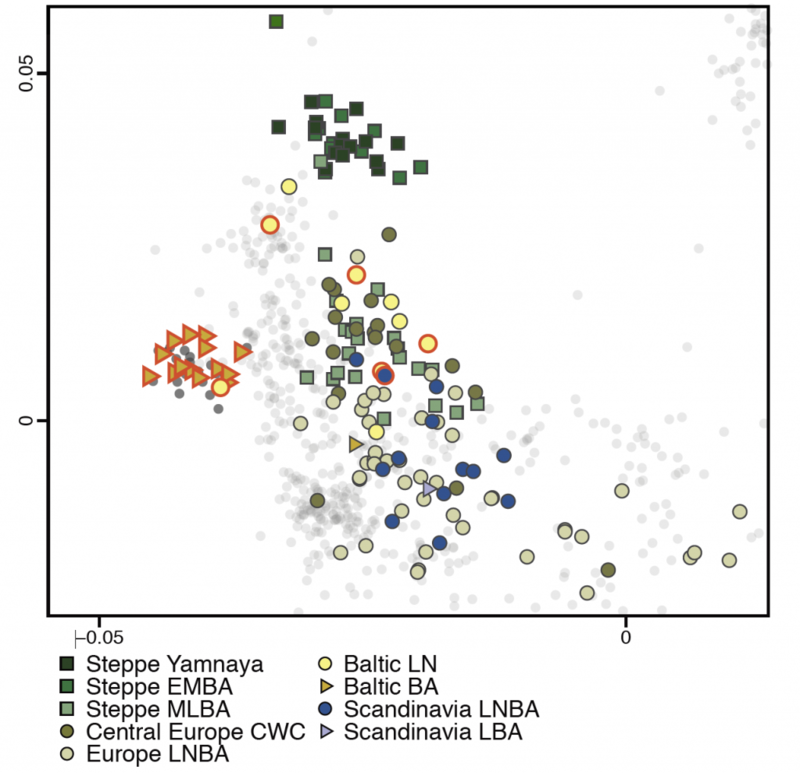 Conversely, the appearance of mitochondrial haplogroup U4 in the Central European Late Neolithic after millennia of absence could indicate female gene-flow from the Eastern Baltic, where this haplogroup was present at high frequency. 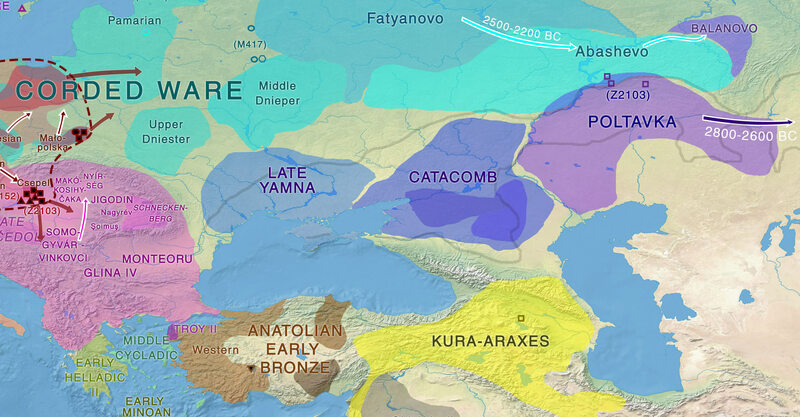 Zoomed-in version of the European Late Neolithic PCA. So, we see that no farmer ancestry is found in the Baltic (unlike in Western Yamna), that PCA of Late Neolithic is closer to Corded Ware samples from Europe (or to earlier samples from the region) and not to Yamna, as suggested at first by the Zvejnieki individual. There obviously was exogamy – which may in fact justify the findings in PCA close to Yamna (like the Zvejnieki sample), although researchers obviate that. Also, as expected, no R1b-M269 in the Baltic (during the Corded Ware period), most are R1a with the majority showing subclade R1a-Z645 (and others poor SNP coverage), which support the reduction in haplogroup diversity to this very subclade during the expansion of Corded Ware peoples, as I predicted it would happen. Local foraging societies were, however, not completely replaced and contributed a substantial proportion to the ancestry of Eastern Baltic individuals of the latest LN and Bronze Age. 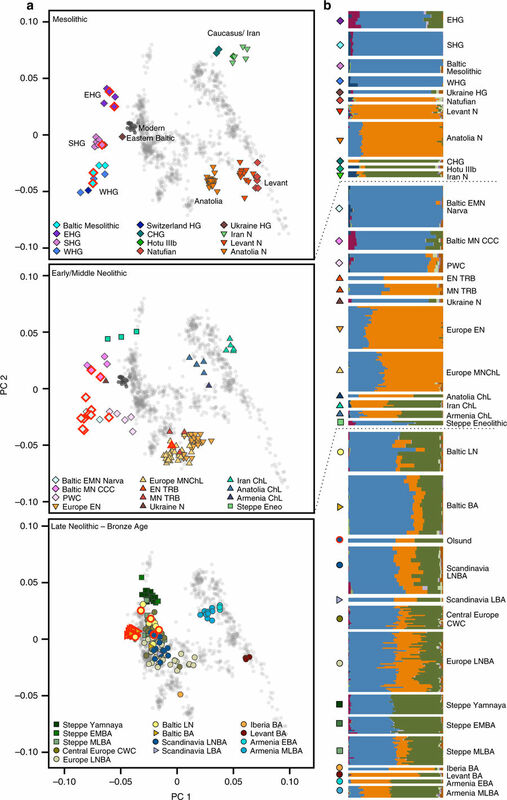 This ‘resurgence’ of hunter-gatherer ancestry in the local population through admixture between foraging and farming groups recalls the same phenomenon observed in the European Middle Neolithic and is responsible for the unique genetic signature of modern-day Eastern Baltic populations. 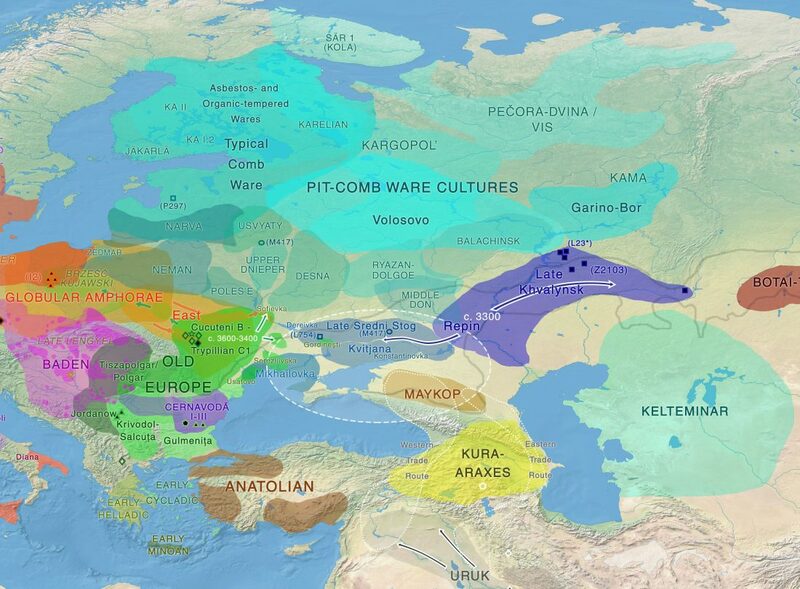 We suggest that the Siberian and East Asian related ancestry in Estonia, and Y-haplogroup N in north-eastern Europe, where it is widespread today, arrived there after the Bronze Age, ca. 500 calBCE, as we detect neither in our Bronze Age samples from Lithuania and Latvia. As Uralic speaking populations of the Volga-Ural region show high frequencies of haplogroup N, a connection was proposed with the spread of Uralic language speakers from the east that contributed to the male gene pool of Eastern Baltic populations and left linguistic descendants in the Finno-Ugric languages Finnish and Estonian. 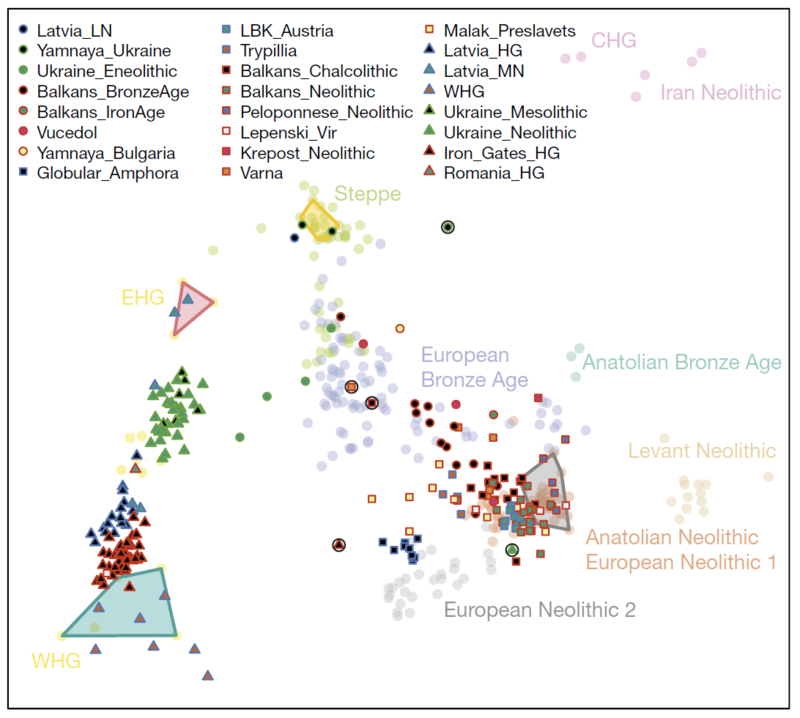 A potential future direction of research is the identification of the proximate population that contributed to the arrival of this eastern ancestry into Northern Europe. Images and text: Content of the paper is licensed under CC-by 4.0. The latest publication of Documenta Praehistorica, vol. 44 (2017) is a delight for anyone interested in Indo-European and Uralic studies, whether from a linguistic, archaeological, anthropological, or genetic point of view. Articles are freely downloadable from the website. The following is a selection of articles I deem more interesting, but almost all are. In the late 5th, 4th, and early 3rd millennia BC, different archaeological units are visible in western Lesser Poland. According to traditional views, local branches of the late Lengyel-Polgár complex, the Funnel Beaker culture, and the Baden phenomena overlap chronologically in great measure. The results of investigations done with new radiocarbon dating show that in some cases a discrete mode and linearity of cultural transformation is recommended. The study demonstrates that extreme approaches in which we either approve only those dates which fit with our concepts or accept with no reservation all dates as such are incorrect. Territory of western Lesser Poland and the main archaeological units in the late 5th, 4th and early 3rd millennia BC: 1 borders of the area discussed in the paper; 2 sites of the Lublin-Volhynian culture; 3 the Wyciąże-Złotniki group; 4 the Funnel Beaker culture (a dense settlement typical of ‘loess’ upland; b more dispersed settlement typical of foothills, alluvial plains/basins and ‘jurassic zones; c highly dispersed settlement typical mainly of mountainous zone); 5 sites with the Wyciąże/Niedźwiedź materials; 6 the Baden culture, 7 the Beaker/Baden assemblages; 8 Corded Ware culture (a relatively dense settlement typical mainly of ‘loess’ upland; b highly dispersed settlement typical of other ecological zones). This article brings new data against David Anthony’s new IECWT model, suggesting later dates for the Corded Ware Culture group of Lesser Poland, and thus an earlier origin of their nomadic herders in the steppe, forest-steppe or forest zone to the east and south-east. New data on one of the cultures that was very likely a close neighbour of Corded Ware peoples. The first ceramic complexes appeared in the forest-steppe and forest zones of Eastern Europe at the end of the 7th–5th millennium BC. They existed until the first half of the 5th millennium BC in the Don River basin. All these first ceramic traditions had common features and also local particularities. Regional cultures, distinguished nowadays on the basis of these local particularities, include the Karamyshevskaya and Middle Don cultures, as well pottery of a new type found at sites on the Middle Don River (Cherkasskaya 3 and Cherkasskaya 5 sites). 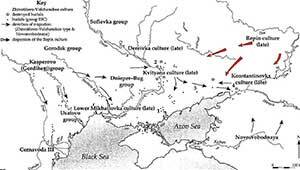 So far, four different cultural-chronological groups of sites have been identified in the North-eastern Azov Sea and Lower Don River areas, including sites of the Rakushechny Yar culture, Matveev Kurgan culture, Donets culture, and sites of the Caspian-Ciscaucasian region. An analysis of all known dates, as well as the contexts and stratigraphies of the sites, allowed us to form a new perspective of the chronology of southern Russia, to revise the chronology of this region, and change the concept of unreliability of dates for this area. During excavations of burials at Zvejnieki in northern Latvia, it transpired that the grave fill included occupation material brought to the grave. It contained tools of a type that could not be contemporaneous with the grave. This is confirmed by the dating of bone tools and other bone finds in the fill. The fill was taken from an older settlement site a short distance away. The fill also included skeletal parts of humans whose graves had been destroyed with the digging of the grave for a double burial. This provides an interesting view of the mortuary practice of hunter-gatherers and an insight into the use of the past in the past. the farmhouse on the site and the gravel pit. I keep expecting that more information is given regarding the important sample labelled “Late Neolithic/Corded Ware Culture” from Zvejnieki ca. 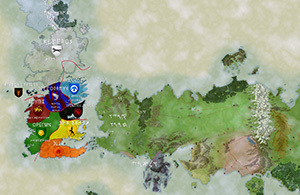 2880 BC. 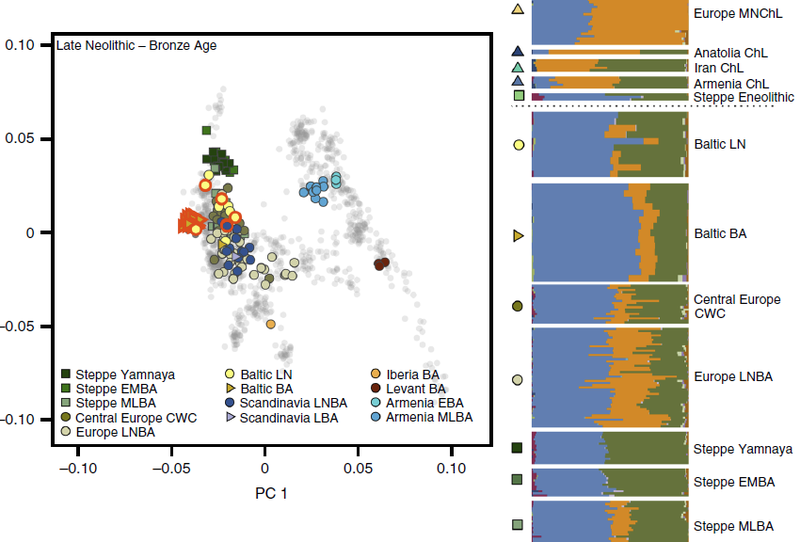 It seems too early for the Corded Ware culture in the region, clusters too close to steppe samples, and the information on it from genetic papers is so scarce… My ad hoc explanation of these data – as a product of recent exogamy from Eastern Yamna -, while possibly enough to explain one sample, is not satisfying without further data, so we need to have more samples from the region to have a clearer picture of what happened there and when. Another possibility is a new classification of the sample, compatible with later migration events (a later date of the sample would explain a lot). Anyway, this article won’t reveal anything about this matter, but is interesting for other, earlier samples from the cemetery. Chronological timeframes of cultural changes in the Dnepr-Dvina region (7th to 3rd millennium BC), by Mazurkevich et al. 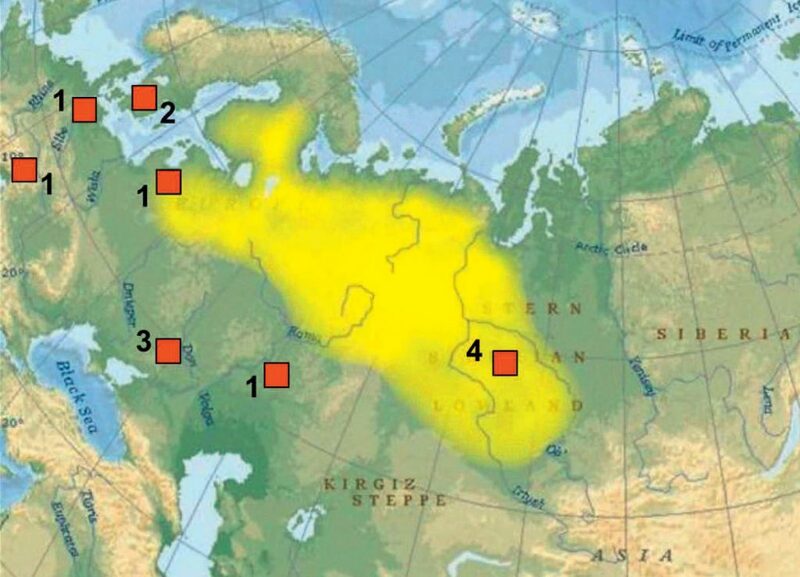 The Early and Middle Neolithic in NW Russia: radiocarbon chronologies from the Sukhona and Onega regions, by Piezonka et al. Periodisation of the Neolithic and radiocarbon chronology of the Early Neolithic and the beginning of the Middle Neolithic in Finland, by Nordqvist and Mökkönen. Radiocarbon chronology of the Neolithic-Eneolithic period in the Karelian Republic (Russia), by Tarasov et al. Chronology of Kama Neolithic culture, by Lychagina and Vybornov. Сhronology of early Neolithic materials of the site Sakhtysh IIa (Central Russia), by Dolbunova et al. Other articles include studies on Neolithic sites, potentially relevant for Indo-European migrations, such as Anatolia, Greece, southern or south-eastern sites in Europe. Check it out! A new article (in Russian), Kinship Analysis of Human Remains from the Sargat Mounds, Baraba forest-steppe, Western Siberia, by Pilipenko et al. Археология, этнография и антропология Евразии Том 45 № 4 2017, downloadable at ResearchGate. We present the results of a paleogenetic analysis of nine individuals from two Early Iron Age mounds in the Baraba forest -teppe, associated with the Sargat culture (ﬁ ve from Pogorelka-2 mound 8, and four from Vengerovo-6 mound 1). Four systems of genetic markers were analyzed: mitochondrial DNA, the polymorphic part of the amelogenin gene, autosomal STR-loci, and those of the Y-chromosome. Complete or partial data, obtained for eight of the nine individuals, were subjected to kinship analysis. No direct relatives of the “parent-child” type were detected. However, the data indicate close paternal and maternal kinship among certain individuals. This was evidently one of the reasons why certain individuals were buried under a single mound. Paternal kinship appears to have been of greater importance. The diversity of mtDNA and Y-chromosome lineages among individuals from one and the same mound suggests that kinship was not the only motive behind burying the deceased people jointly. The presence of very similar, though not identical, variants of the Y chromosome in different burial grounds may indicate the existence of groups such as clans, consisting of paternally related males. Our conclusions need further conﬁ rmation and detailed elaboration. Keywords: Paleogenetics, ancient DNA, kinship analysis, mitochondrial DNA, uniparental genetic markers, STR-loci, Y-chromosome, Baraba forest-steppe, Sargat culture, Early Iron Age. 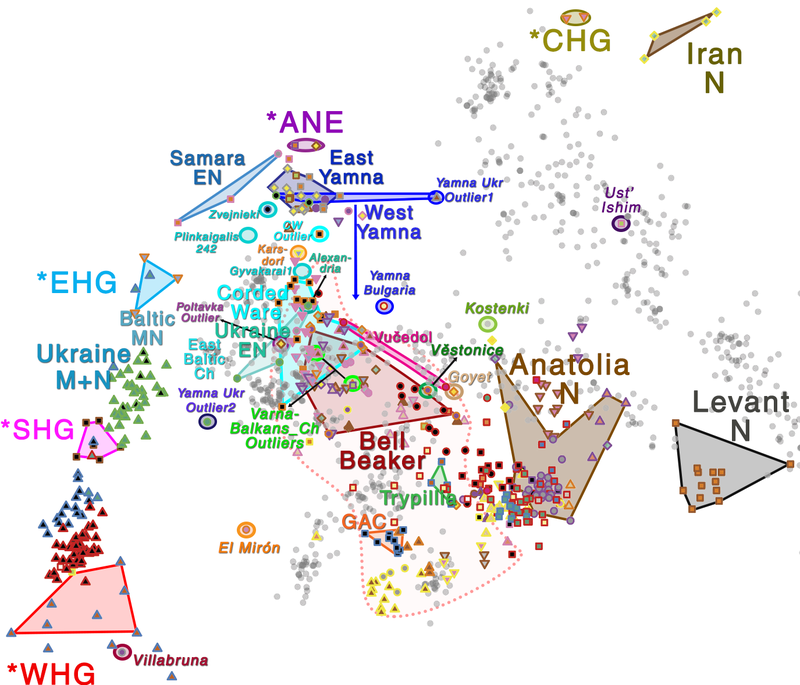 This is the same team that brought an ancient mtDNA study of different cultures within the Baraba steppe-forest region (from the Open Access book Population Dynamics in Prehistory and Early History). The Baraba steppe-forest is a region between the Ob and Irtysh rivers (about 800 km from west to east), stretching over 200 km from the taiga zone in the north to the steppes in the south. The new study brings a more recent picture of the region, from the Iron Age Sargat culture, ca. 500 BC – 500 AD, with five samples of haplogroup N and two samples of haplogroup R1a. 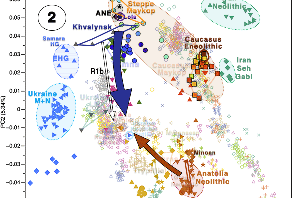 R1a lineages in the region probably derive from the previous expansion of Andronovo and related cultures, which had absorbed North Caspian steppe populations and their Late Indo-European culture. N subclades prevalent in certain modern Eurasian populations are probably derived from the expansion of the Seima-Turbino phenomenon. N subclades (potentially originally speaking Proto-Yukaghir languages) gradually replacing haplogroup R1a (originally probably speaking Uralic languages), probably through successive founder effects (such as the bottlenecks found in Finland), which left their Uralic culture and ethnolinguistic identification intact. Therefore, late Corded Ware groups of North-Eastern Europe (in the Forest Zone and the Baltic), mainly of R1a-Z645 subclades, probably never adopted Late Indo-European languages.